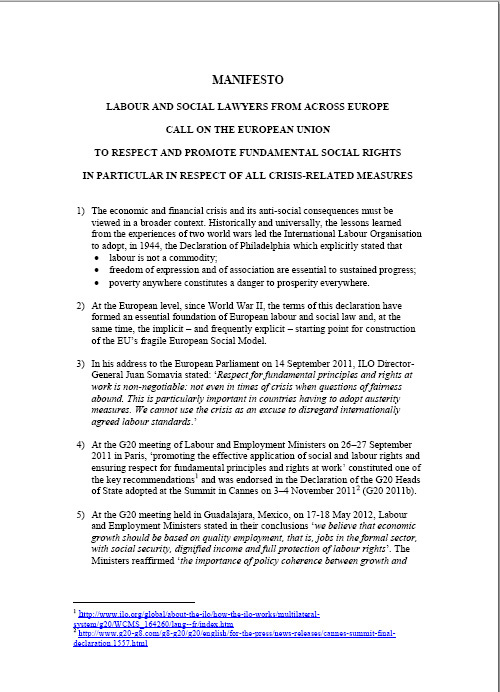 Very recently, at its 316st session (1-16 /11/2012), the ILO Committee of Freedom of Association examined complaints submitted by the Greek General Confederation of Labour, the Civil Servants' Confederation, the General Federation of Employees of the National Electric Power Corporation, the Greek Federation of Private Employees, and supported by the International Trade Union Confederation, concerning austerity measures taken in Greece over the last two years within the framework of the international loan mechanism agreed upon with the Troika (EC, ECB and IMF).The Committee found that violations of ILO Conventions 87 and 98, in particular, were entailed by the request for suspension of and derogation to the collective agreements as well as derogation in pejus and decentralisation of collective bargaining. So far 150 colleagues from the legal academic community have signed the MANIFESTO. Furthermore, the MANIFESTO is currently be translated in the official languages of the EU.